Full of vibrant color, this unique work is the work of artist Don Li-Leger. 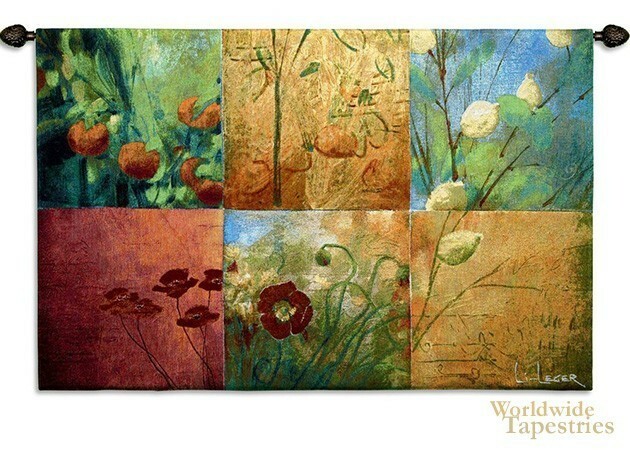 This modern floral art "Citrus Garden" tapestry shows a scene of poppies and fruits in an abstract scene. This work is both 6 individual scenes as well as a cohesive whole. The colors are tremendous in this work and is vibrant and glorious. The sophisticated blue greens go very well with the reds, gold, lemon yellows and beiges in this work. Often called Asian fusion, the style of Li-Leger is unmistakable. This modern floral landscape tapestry "Citrus Garden" is backed with a lining and has a tunnel for easy hanging. Note: tapestry rod, where pictured, is not included in the price. Dimensions: W 52" x H 33"